Removal ProcedureRaise and support the vehicle. Refer toLifting and Jacking the Vehicle.Drain the transfer case fluid. Refer toTransfer Case Fluid Replacement.Drain the transmission fluid. Refer toTransmission Fluid Drain and Fillfor the 6T30/6T40/6T45 orTransmission Fluid Drain and Fillfor the 6T70/6T75.Remove the propeller shaft. Refer toPropeller Shaft Replacement.Remove the right wheel drive shaft. Refer toFront Wheel Drive Shaft Replacement.Remove the catalytic converter. For the LFW engine, refer toCatalytic Converter Replacement - Right Sideand for the LAF engine refer toCatalytic Converter Replacement. 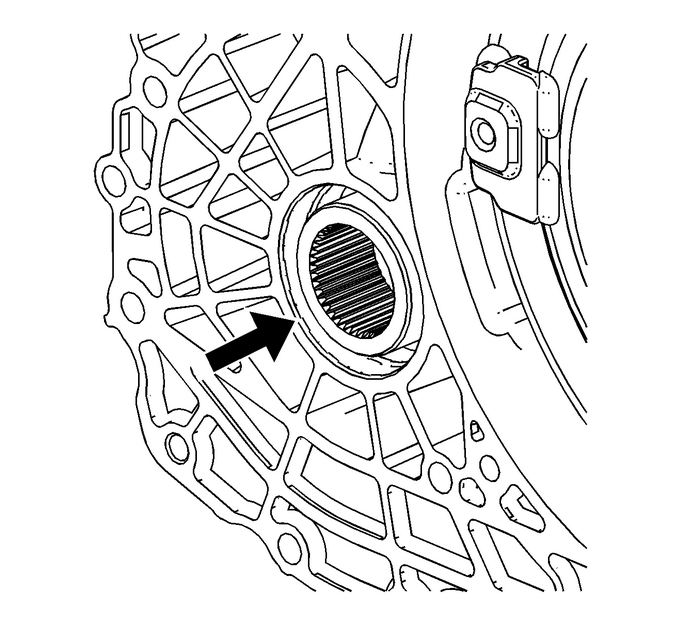 Note:Oxidation must be removed from the transmission torque converter housing bore beforeinstallation of the transfer case. A clean bore will prevent oxidation build up fromscuffing or cutting the O-ring seal upon transfer case installation, resulting ina leak. Carefully insert a clean soft cloth into the transmission torque converter housingdifferential bore to prevent debris from entering the transmission.Clean the oxidation from the transmission torque converter housing differential boresurface using steel wool or crocus cloth.Carefully remove any debris and the cloth from the transmission torque converter housingdifferential bore. 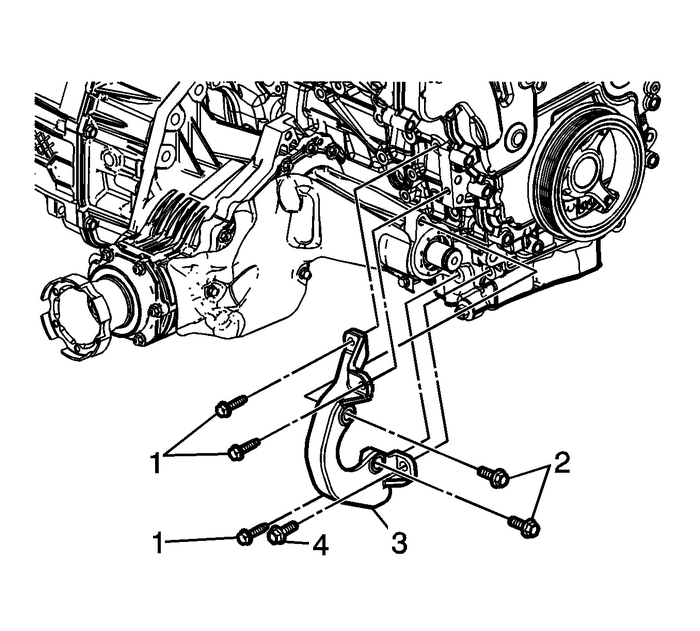 Note:Use guide pins to aid in alignment and installation of the transfer case to the transmission.Failure to use guide pins may result in cutting the transfer case O-ring seal duringinstallation of the transfer case causing a fluid leak. Fabricate 2 guide pins by cutting the heads off of 2 bolts M12x1.75x75. chamfer andremove burrs from the cut end of the bolt.Hand thread the guide pins (1) into the transmission upper and lower transfer casemounting bolt holes. 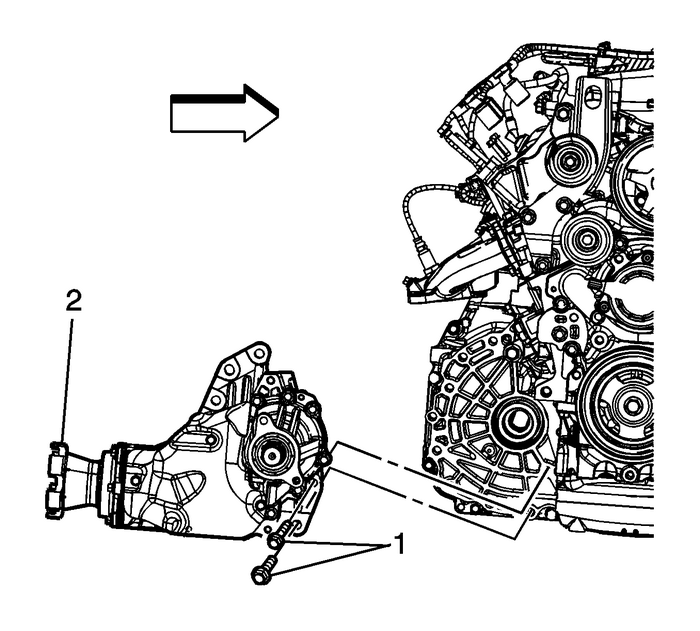 Note:Transmission fluid may creep from the transmission bore during installation. 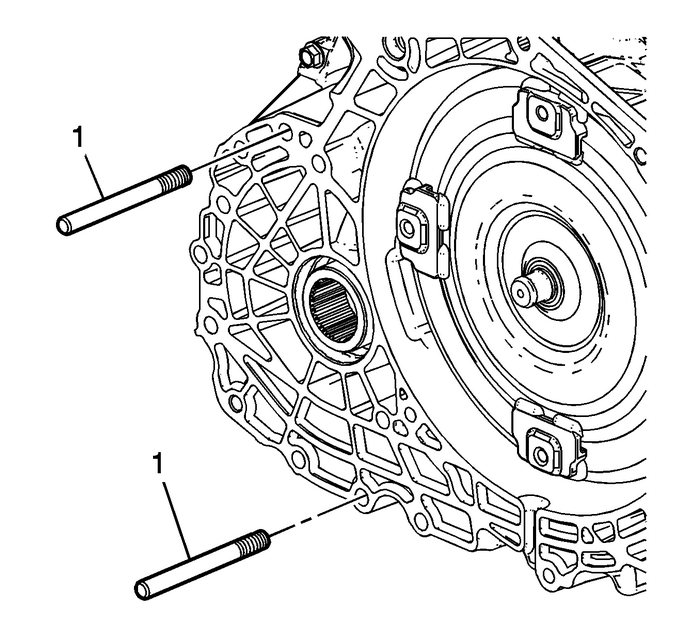 Thoroughly clean the transmission bore and ribbing of fluid and debris immediatelyprior to installing the transfer case. Install the transfer case-(2) to the transaxle.Remove the guide pins. Install the transfer case brace-(3). Refer toTransfer Case Brace Replacement.Install the catalytic converter. For the LFW engine, refer toCatalytic Converter Replacement - Right Sideand for the LAF engine refer toCatalytic Converter Replacement.Install the right wheel drive shaft. Refer toFront Wheel Drive Shaft Replacement.Install the propeller shaft. Refer toPropeller Shaft Replacement.Fill the transmission fluid. Refer toTransmission Fluid Drain and Fillfor the 6T30/6T40/6T45 orTransmission Fluid Drain and Fillfor the 6T70/6T75.Fill the transfer case with fluid. Refer toTransfer Case Fluid Replacement.Lower the vehicle.